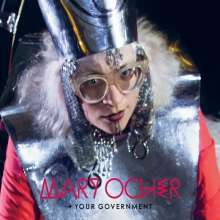 (is) For her fourth full-length album Mary Ocher, underground avant-pop artist, has recruited drum-duo Oliver Rivera-Drew and Stefan Widdess to form Mary Ocher + Your Government. Ocher, a self-taught musican born in Moscow, lived in Tel Aviv and currently residing in Berlin, is a veritable globetrotter which is reflected in her music’s anarchic pick and mix of genres that converge to shape her very own distinctive soundscape. The self-titled LP released in January 2016 on krautrock pioneers Faust’s label Klangbad is described by Ocher as ‘new tribalism’. Sonically the album is dominated by tribal rhythms upon which Ocher adds a variety of vocal textures ranging from guttural sounds to howls and laughter, all of which is layered with sparse synth hooks. A fusion of elements of krautrock, trance, new/no wave meshed together to form a set of tracks that evoke an incantation or ritual. Throw in Ocher’s signature stage garb – a gown, paillettes, tinfoil hat, warpaint and thick glasses and you get a musician combining cabaret theatrics with dark mystical undercurrents like no other.